Reverse engineering an air-conditioner remote – How does this thing work? I’ve never done any reverse engineering before, but spurred on by this recent Hackaday article, and this article I found I thought I’d give is a crack. The first issue: I had no idea what the model number was – it’s not written on the unit, nor on the instruction manual. So I just googled for Fujitsu airconditioner remote, hit image results and looked for one that looked the same. Once I found it and clicked through to the source page, I found out that it is a UTB-YUB/GUB/TUB (There are three model numbers depending on where in the world you are). 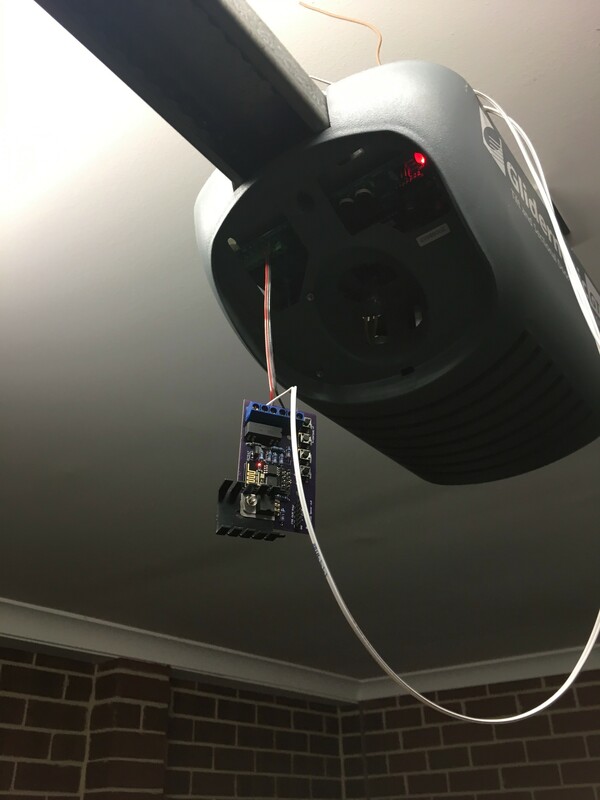 I found a supplier on ebay (who was actually Melbourne based), who had a new remote unit for $60, which I bought as I wanted a test unit on my workbench – mainly because trying to test things using the unit on the wall would be really annoying. While I waited for it to arrive, I continued googling to find as much info as I could about it. Thankfully, a number of airconditioning repair places have their installation manuals online. Reading though the them, it was clear there was a three wires that connect the remote to the outdoor unit – +12V, GND and a signal. Now, I need to work out what this signal wire does. My first hypothesis was the remote unit worked a lot like an IR remote – every button press sent the complete state to the outdoor unit. If this was the case, it should just be a matter of hooking up a DSO (I have the LabNation SmartScope), copying the signal and replaying it via a microcontroller. While I could pull the one off the wall, I patiently waited for my test unit to arrive. 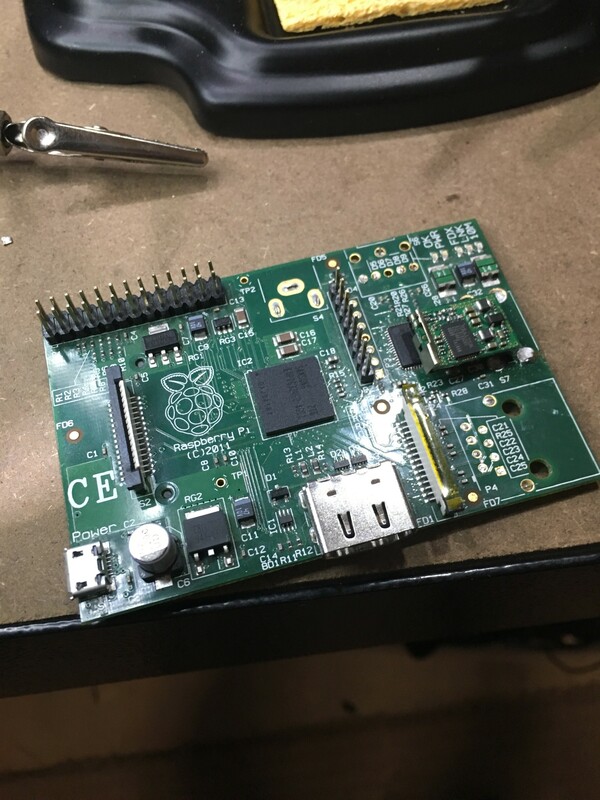 I had a couple of the original Raspberry PIs on my desk, and since they were just sitting gathering dust they seemed like the perfect candidate for this project. I don’t know why, by the composite port really irks me. I’m never going to use it, and it really juts out, and realistically this was going to be WiFi only, so I could get rid of the network port. Also, plugging in a Wifi adapter made the board unnecessarily long. Time to trim it down a bit. First, I removed the composite port by clipping the leads and desoldering the remains. Finally, I removed the USB sockets. Much neater! And regular shaped. Of course, there is now no way to interface with it. 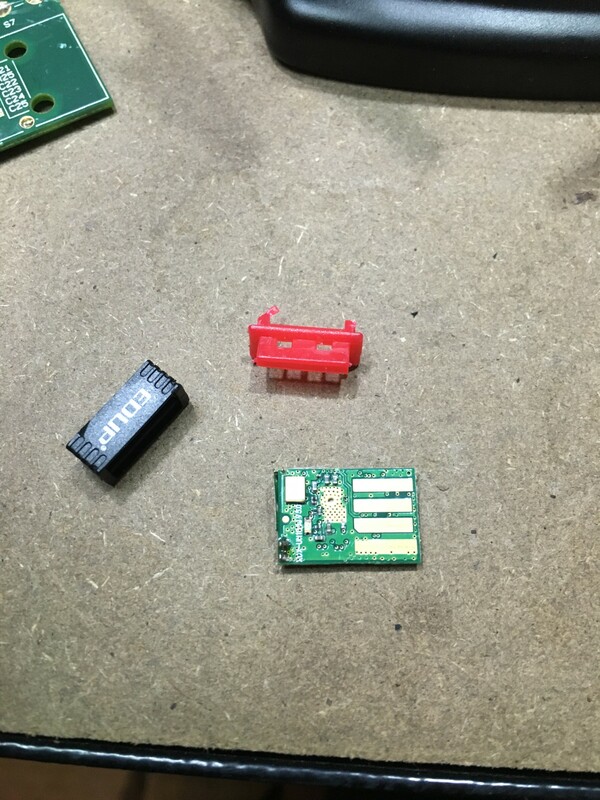 I took a perfectly good USB WiFi module and gutted that. And then direct soldered it to the PI. Now I have a minimalist WiFi-enabled RaspberryPI! If I need to make any changes, I just ssh in and do it via command line. 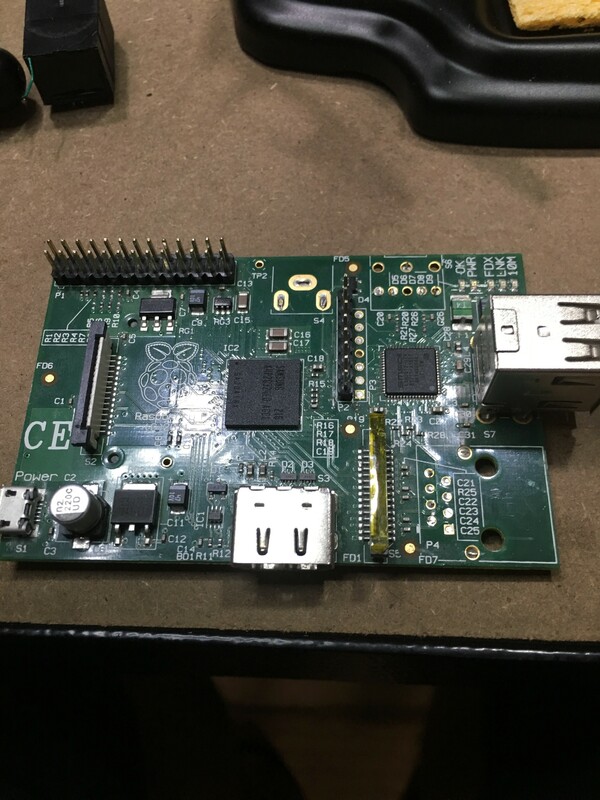 If I really need a keyboard, I’ll just put the SD card in another PI that is more fully featured, and do it there. Even though I still have to complete the captivate portal, and over-the-air updates, It seemed like a good time to wire the controller in and see how it all works off the bench. It’s a good thing I did, as I discovered a few issues with the board. Originally, I had two switches: one of when the door was completely open, and one for completely closed. Based on the last state, I could guess whether the door was opening or closing. I must admit, I realised long after I ordered and built the board that I really only needed one switch that indicated the closed position. Good thing really, because the device got completely confused after I installed it. Because of the limited number of IO pins on the ESP8266-01, I had to pull some tricks to give me two switches and a relay (I can’t take credit, this is an amalgam of a bunch of stuff I found Googling). There are 4 GPIOs, two of which are shared with the TX and RX pins on the serial port. To make things even more interesting, GPIO0 needs to be held high on boot, otherwise the device goes in to programming mode. 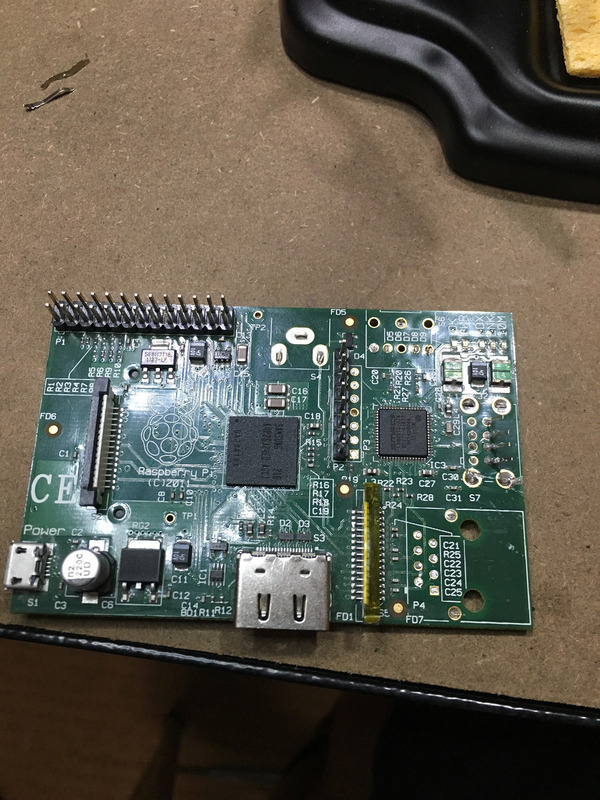 This means GPIO0 is no good as a switch interface – if there was a power outage and the switch attached to GPIO0 was closed as it rebooted, the device would be stuck in program mode. Conversely, when the device boots up, there is a bit of chatter on TX, so putting the relay on that would be risky – a reboot could cause the door to trigger, and open it when no one was home. Wiring the relay to GPIO0 and GPIO2 is quite easy, pull them high with pull-up resistors, then switch them to outputs during the setup phase. Setting them both low at the same time sets the relay up. Pulling GPIO2 up, drives the base of a transistor and energises the relay. While the output of the chip could drive the relay directly, I’m actually using a 12v relay that is driven from the convenient 12V output from the garage door controller, so the transistor is required to switch the higher voltage from the lower 3.3V coming out of the regulator. The “closed” switch is wired to the RX pin, and the “open” switch is wired to the TX pin. This means that the Serial Port is disabled, which can make debugging difficult, so as I work, I usually disable the switches. This all worked fine on my bench, but as soon as I installed it the close switch wouldn’t register properly, and I couldn’t work out for the life of me why. I suspect the internal state machine wasn’t transitioning properly, possibly because of contact bounce, but it turns out it didn’t matter – I also found what I would call a show stopper: I discovered that if the TX pin was held high (ie the device booted when the door was open) it would never start. In a quick refactor of the code, I disabled the state machine, replacing it with a simpler open/close state – if the “closed” switch is closed, the device reports closed, if it’s open, it reports open. Keep it Simple. Who knew, right? Another nice side effect is I can use Serial.println for debugging again. Bonus. Originally, the GND for both switches shared a screw terminal, although now I can get rid of the open switch, I can keep the board to five screw terminals. (Improvement) Add a jumper to switch between using the 5V off the FTDI cable and an external supply – I was using a fly leads soldered to the bottom of the board while testing. 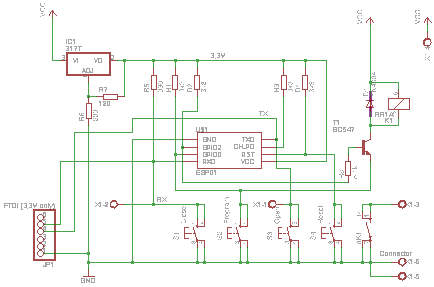 As a PCB board designer, I’m an excellent software engineer. I wrote about my “generic” config class in a previous build log, and alluded to how I wasn’t really sure it was the best plan of attack. All of the casting was painful, the setup was annoying and unnecessary (From both a memory and CPU time POV) – there was little (if any) advantage in using it. In the end, I wrote a concrete class with mutators for each attribute. This meant each attribute is already the correct type, so there was no annoying casting, and I could control and optimise the serialisation and deserialisation. You can see the class on Github. The boolean values (as well as encryption mode and mqtt Auth mode) are compacted using bit-masks, effectively fitting five config items into one byte. Next, I store single integer and double integer values (I use doubles for port numbers), and finally strings. The strings are encoded by putting their length in the first byte, effectively limiting string length to 255 characters, which is fine – DNS names are limited to this, and that is the biggest thing the config will store. It also makes it possible to avoid overruns, as we have an effective upper limit, so if we go past that index, we know something is broken. 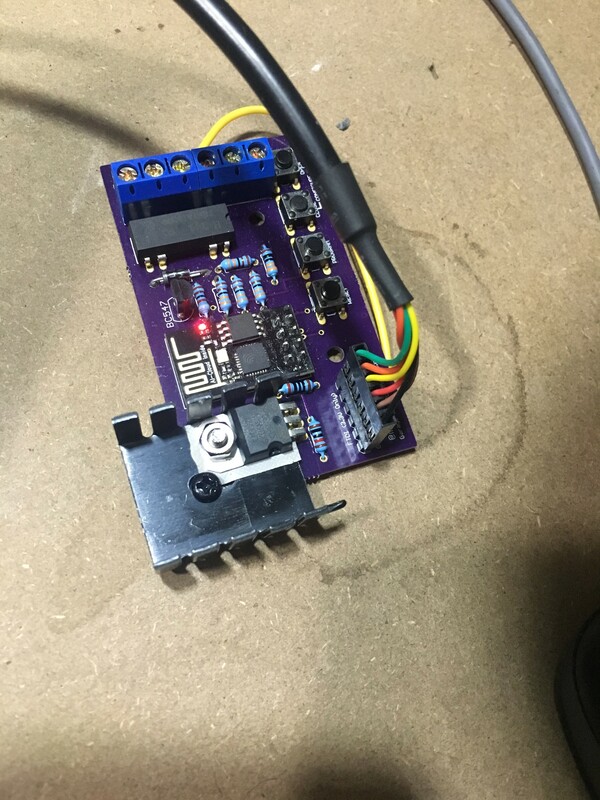 Up until now I’ve been testing the door opener using a pigtail off the 5V line on the FTDI cable – the board has a LM317T regulator setup to output the 3.3V that the ESP8266 requires. The installation point for this board is a 12V output from the garage door controller. Those of you with a bit more experience with voltage regulators would realise where this is going… I plugged the board in to a 12V supply and noticed that the regulator was getting really hot. On my lunch break today, I made my way to Jaycar to grab a heatsink. I was thinking about the little clip on ones, which I looked up on the website while I was on the tram, and I came across “thermal resistance” in the specs. I had no idea what this was, but I knew that it was probably an interesting specification to look up. After googling it, I discovered it is a measure of how many degrees the heatsink will heat up per watt it is dissipating. Some more googling and I found this page around heatsinking the LM317T, which had all the magic formulas that I needed. I had two parts of that equation: Vin = 12V input, and Vout = 3.3V, so I needed to work out the power draw of the ESP8266. The little clip on heatsinks have a thermal resistance of 30 C/W, which is double what we need. By this stage I had arrived at the store, so went to the heatsink section to see what they had. They had this guy, which has a thermal resistance of 12 C/W. Perfect! It was quite large though, and I knew they board was tight, so I had to be a little creative in fitting it. I’m a little annoyed that it doesn’t sit on the board properly, but I couldn’t stand it up, as there was limited room above the board, so it was the best I could do without redesigning an new board. So, it turns out the ESP8266-01 (at least the one I have) supports 1MB of storage. I had been butting up against the 512kB I thought I had, and it turns out I needn’t worry. Will tell you what your chip supports. This means I can probably incorporate Over-the-air updates, which will be handy. I still need to keep the image under 512kB (OTA needs the space to upload the new image). I’ve mentioned before that I plan on using mDNS to resolve the name of my server. While the ESP8266 Arduino library can broadcast a mDNS name, it doesn’t query mDNS when resolving names. I found mrdunk’s mdns on Github that implements enough of the mDNS protocol, that I should be able to hack mDNS name queries into the project. I spun up a quick proof of concept sketch to see how it all works. // This sketch will display mDNS (multicast DNS) data seen on the network. // When an mDNS packet gets parsed this optional callback gets called once per Query. // See mdns.h for definition of mdns::Answer. // If you don't want the optional callbacks, just provide a NULL pointer as the callback. The sketch sends a query out for mqtt.local. We are building up a query struct with the requested host name, and a qtype of 0x01 (host address query), and qclass of 0x01 (internet). When a response is received, the name is checked against the name we requested, and if it matches, the IP address and Time-to-Live (TTL) are printed to the Serial console. The name check is required, because that answerCallback will get called every time a mDNS packet is received, regardless of who sends it – It can get quite chatty. I found that I needed to call Clear() before adding the query, otherwise the packet was filled with garbage – Clear seems to initialize all the required buffers. For name resolution, all I really need is the IP address and TTL. My plan is to have an array of names that I need to resolve (for the moment, it’ll be a maximum of two – one for the MQTT server, and one for the log file server). If either of those names end with .local, I’ll resolve the name using mDNS. On the first request, I’ll cache the result speeding up subsequent requests. I can use the TTL to expire the cached version, and re-query the network when required. A little clunky (it would be nice if the underlying network stack automatically did this), but it should work. Trying to get mDNS queries working hasn’t quite been as straight forward as I was hoping. I mentioned in a previous log that I found a library, but it was a little overkill for what I need, so I did what any silly software developer does: started rolling my own. How am I justifying this? Well, I’m fast running out of space. The GitHub version of the ESP8266 hardware definition I’m using is significantly larger than the distributed version, so I only have about 10k of program storage left – as a result I’m being more weary of how much source code I’m uploading. Since I don’t need to respond to mDNS questions (the ESP libs have one built in), I can skip question parsing, and since I’m only interested in name browsing, I can ignore a all bar two classes of responses. And sometimes learning a protocol can be fun. Sometimes. My completed library can be found here. The first thing I did was work out how mDNS works. It’s a pretty clever hack – It reuses standard DNS packets, but rather than ask a specific DNS server to answer a query, mDNS clients just broadcast a UDP packet to anyone who will listen. If another listener can answer the question, it broadcasts the answer. You can see more information about the packet format on the mDNS Wikipedia page. Looking at the packet structure, and looking through the code from this mrdunk’s library, as well as some packet sniffing using wireshark, I was able to generate questions and parse answers. This was very much proof of concept code that was embedded in my project, and it worked, though it lacked formal testing, and this would definitely be something I would want to reuse in the future. ime to break it out in to another library. Don’t use exceptions (you can’t on Arduino), so most functions return a status code indicating success or error states. Don’t include unnecessary libraries. I thought I would do the right thing and use std::string which abstracts string handling. This made my library’s object file an order of magnitude larger. Reverting back to regular char* string keped everything nice and small, and as I didn’t need to do much actual string manipulation, the trade of was totally worth it. I’m a big believer in automated testing. Especially for something as low level as a library where you rely on certain types of network packets. Automated testing on an Arduino is probably possible, but since I’m not doing anything too Arduino specific, I was able to build a test suite that ran on my laptop. This made the test cycle much quicker as I didn’t have to wait for my code to upload. The downside is I need to mock out a few objects, but with some clever code organisation I managed to avoid too many mocks. I found Catch which is a header-only, lightweight testing framework for C++. It was pretty easy to setup, and works with TravisCI, so every time I commit a change the tests run automatically. Travis was a bit of a pain to setup, as the C++ they run is ancient, so I needed to setup a custom toolchain in travis.yml. Once I had everything written and tested, I was able to drop it in to the Garagedoor sketch, and now the sketch can find the mqtt server! Up to this point, all of the settings have just been stored in the source code. This will make changing these setting pretty difficult, so I’ll need some way of setting, reading and storing them. Being a web developer, the first thing I thought of was JSON. There is an Arduino JSON library, and it’s supposedly pretty efficient. Memory is still pretty tight though, and there is some parsing involved, so I started looking at something a little more lo-fi. The easiest way to go about this would be to create a class with members that match the required settings, but I wanted to make something a bit more re-usable. I knocked up a quick class that allows me to define the layout dynamically. * Returns the config option that maps to the supplied key. It consists of two classes: ConfigOption and Config. Config has an array (up to CONFIG_MAX_OPTIONS) of ConfigOptions. The addKey method adds a ConfigOption to the Config Option. It takes a maximum length, so that we can pre-allocate memory for each string. This makes each configuration length a known quantity, reducing the change of buffer overflows. There is also a read and write method that reads and writes a blob of data to the SPIFFS flash area. The file format is very simple: a set of concatenated strings of a fixed length – because the class knows the length of each string, it knows exactly where to read each option from. This does make removing or changing the length of an option difficult, though. This sets up each of the keys with a name, a default value and a max length. It then reads in the configuration file from the flash. Note: every config comes back as a string, so they need to be cast if required. The beauty of using a config file read from flash means I can build the configuration externally and upload it, which means I don’t have to have a configuration system built yet – and it means I know exactly what config options I’ll need when I finally build the configuration system. Some sensitive settings have been redacted. And then run it. It’ll generate a config.dat file, that I just copy to the data directory of the Arduino project. I then upload it using the ESP8266 Sketch Upload tool. I’m not 100% sold on this, I wonder whether I should just create a class with static members, rather than dynamically building it. Ironically, it might be better to build the strings dynamically so only the memory required is used (up to a maximum length to avoid those scary buffer overflows). If I start hitting memory limits, I’ll revisit. While I want to do full CA verification, I’m waiting on some of the bugs to get ironed out of the ESP8266 Arduino library, so I’ll take a shortcut for the moment, and use fingerprinting to verify the server certificate (It should be pretty easy to move to CA verification down the track). I was reading through the docs, and while the axTLS says it supports PEM, I found that I needed to convert the PEM format certificate (which is ASCII based) to DER which is binary. Down the track, I’ll be able to upload the certificate and key via the administration console (certificates expire, and need to be updated), which means storing them in the code makes little sense. Instead I’m going to store them on the flash as a file. ESP8266FS is a tool which integrates into the Arduino IDE. It adds a menu item to Tools menu for uploading the contents of sketch data directory into ESP8266 flash file system. Select Tools > ESP8266 Sketch Data Upload. This should start uploading the files into ESP8266 flash file system. When done, IDE status bar will display SPIFFS Image Uploaded message. The device will connect at this point, and the mosquitto server will be happy. It will use the name on the certificate as the client name, and the connection will be encrypted. Notice that all of the colons have been replace with spaces. Because of the way the PubSubClient works, I need to make a (pre? )connection to the server to do the verification. It’s pretty simple – connect, verify and disconnect, then continue with the PubSub connection. There is a problem here – the mDNS name won’t actually resolve at this point. Because the DNS resolver doesn’t support it.